Warm Anglo-Catholic liturgy with full lay participation and children's talk. We meet every Sunday at 11:00 am. For the time being, for All Souls’ matters please contact one of the Churchwardens: Mrs. Monica Richardson-Sowe Mr. Michael Campbell info@allsoulsleeds.org.uk. Thankyou. ANNOUNCEMENT OF APPOINTMENT The Revd Alice Isabel Glass Snowden, Team Vicar Leeds All Souls and St Aidan in this diocese, to be Assistant Area Dean of Allerton. Donations are coming in all the time, and we have now over Â£3,000 towards the conservation of Emily Ford’s paintings. Many thanks to VicSoc WY Group and 25WAG for the support and help! 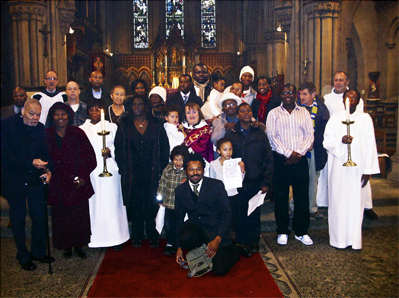 February 24th 2013 – Holy Baptism! We welcome Andrew’s family and friends as he is baptized today. The regular worship schedule for All Souls’ is now: Sundays at 11:00 Wednesdays at 10:00 (said service) All welcome! “Weather permitting”! Mass on Sunday at 11:00; on Wednesday at 10:00. On Wednesday evening at 19:30 – Mass with Ashing for Ash Wednesday. All welcome.